This wonderful lady is turning 85 this week and still living life to the absolute full. 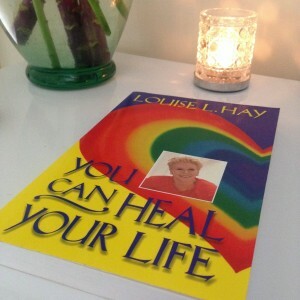 After healing herself from cancer, Louise went on to write the best seller ‘You Can Heal Your Life’ – an amazing book that I recommend to any of you who are on a healing path or interested in the mind-body link. She also founded Hay House Inc, the publishing company that has most probably published many of the books on your bookshelf today if you are anything like me and have a big stack of mind, body, spirit books. This just touches on some of the amazing things this remarkable lady has done. Louise’s story inspires me, not only because of the powerful lessons she teaches, but because it reminds me that there is no rush. Everything is unfolding exactly as it should be. Something that can come up for many of us, especially those of us with long term illness, is a sense of life passing us by. Of there not being enough time. It can be incredibly anxiety provoking if through no choice of your own, you find yourself having to live life at a snails pace. If you are an ambitious person with hopes and dreams it’s one of the most difficult things, to learn how to be patient and to trust, that there is enough time. That everything is just as it should be right now. That it will all be okay. Sometimes all we can do, is wait for the storm to pass. Louise’s story reminds me that there is time. And most importantly, that the lessons we learn in the midst of our difficult times, are the ones that will most definitely, change the way we live our life…for the better. You always write the exact message I need to hear. This is beautiful.